German Chancellor Angela Merkel arrives on Thursday evening with a two-day visit to Athens. In the capital of Greece, which Merkel last visited four years ago, she will hold meetings with Prime Minister Alexis Tsipras, President of the Republic Prokopis Pavlopoulos and opposition leader Kyriakos Mitsotakis. The latter will be for her personally, the success or failure of the entire enterprise is the most important. The program of the visit and in an exclusive interview with Merkel to the most insightful Greek newspaper Katimerini lists several topics that will be touched upon during the Athens talks - bilateral relations (“partnership and friendship with Germany”), the efforts of Athens and their sponsors to get GreecSkopje's accession to the EU and NATO. This item will be the most important during the visit. Everything else, for example, the mass protests of the Greek leftists in connection with the visit of the politician, whom many Greeks consider guilty of their poor situation, timid conversations of the receiving party about the need for Germany to pay reparations for the years of the last war - can be simply ignored. With the exception of hooliganism on the streets of Athens, which the Greek leftists cannot deny themselves tonight, despite the mobilization of two thousand policemen, all these will be words and only words. All affairs will be connected with Macedonia and the consequences for the internal political situation in Greece of the recent deal of Athens with Skopje - the Presidential Agreement, which so pleased the USA, EU, NATO and upset Russia, which does not want to expand the alliance directed against it in the Balkans. This is indicated by the fact that Merkel went to Athens on the eve of a vote in the Greek parliament on a deal with Skopje. Despite the fact that the Greek government, in the form of gratitude for its approval, received from the Western partners a number of financial concessions, the overwhelming majority of the Greek people for nationalist and, in fact, irrational reasons, strongly oppose retaining the word “Macedonia” in the name of the neighboring Slavic-Albanian country and rejects the Prespa Agreement. The majority of Greek politicians who are torn between loyalty to the West and the mood of their own voters adhere to the same position. Meanwhile, according to this document, Skopje or FYROM (the Former Yugoslav Republic of Macedonia), as often referred to in Greece with contempt, is a quite respectable Republic of Northern Macedonia. “European prospects” are opening up before it, which delight most Macedonians, since they have nothing to lose. But the Greeks remain at the wreckage of the historical myth they fostered. The truth is that the genome of both peoples after the perturbations of the Hellenistic, Roman, Byzantine and Turkish periods of their joint history is almost the same, only language distinguishes them. As the “Naphtemboriki” newspaper notes, the Greek authorities hope that Merkel’s visit will put the leading opposition party “New Democracy” in a difficult position, which intends to vote in parliament against the deal of the Tsipras government with Skopje. The chairman of this center-right party, which unites wealthy and nationally-minded Greeks, Kyriakos Mitsotakis, tacking between the interests of the West and his electorate, states that after coming to power, he will begin repeated negotiations with Skopje. At the same time, the Independent Greeks (IG) party of the government coalition with Tsipras SYRIZ, a small nationalist party whose leader, National Defense Minister Panos Kammenos is a very big friend of the United States, also does not support the deal with Skopje, considering it a betrayal of the interests of Greece. It will be very interesting to observe how Kammenos himself, who had recently smiled at his Russian counterpart Sergei Shoigu in Moscow, would behave when voting, and before that he had offered the Americans to open several military bases in Greece. He claims he will vote against. Although surely a couple of deputies from this party will not stand against blackmail and will vote as it should. It is completely obvious, however, that neither the neo-Nazis and the more radical Greek nationalists from the Golden Dawn, nor the ever-opposition Communists will support the Prespaan Agreement, and Tsipras will not receive the cherished 151 votes. The voices of the situational allies in the person of the centrists and the moderate left, who to a lesser extent - like cosmopolitan and internationalists - are subject to the "Macedonian disease", may not be enough for Tsipras. After expressing a vote of no confidence in the parliament in Greece, early elections will be held, in which SYRIZA is awaiting defeat and as a result of which the New Democracy ( ND) will most likely come to power. According to all polls, she is confidently leading in the preferences of voters. On Wednesday evening, Tsipras announced in a television interview that he would raise the issue of trust in the government if parliament rejects his deal with Skopje. So it will be so. Curiously, the talks between the prime minister and his minister of war, scheduled for Tuesday, were postponed for several days. They will take place when Merkel leaves Athens, and will pass, apparently, depending on what “cookies” she brings with her, because Germany was and remains the main Greek sponsor. Therefore, this weekend it will be clear what Greece expects in the coming months. Most likely, if Merkel fails to create a miracle, the coalition government of SYRIZA and IG will collapse. Both of the “partner” who had long since quarreled among themselves are already preparing for such a prospect. Who will be the main interlocutor of the German Chancellor in Greece? Nevertheless, the key figure on which it depends on whether the Presidential Agreement can be pushed through the Greek parliament is the leader of the center-right Mitsotakis: if the ND supports the deal, then Kammenos and other critics will be in the minority. Swearing with the West, thirsty to quickly include all the Balkans in the EU and NATO, which for a long time was hampered by the absurd “title dispute” between Athens and Skopje, Mitsotakis did not want at all. After all, ND has always been and remains a party of the Greek establishment. However, the support of this deal from this young and ambitious politician, a representative of an influential political family, will be fraught with a split in his party, where he has many opponents. And this catastrophe can break out exactly when Mitsotakis is one step away from the premiership. 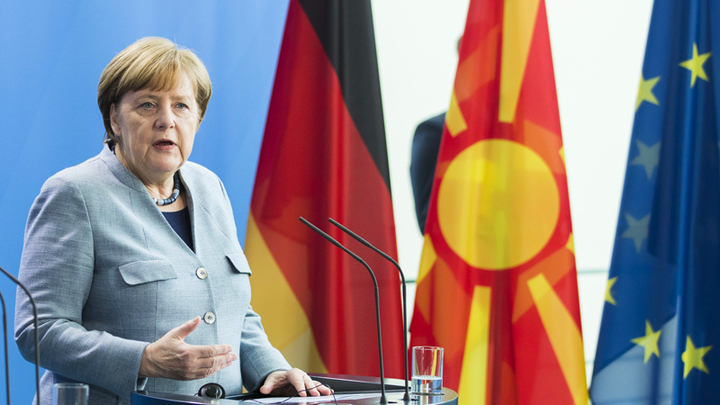 In this regard, Katimerini tried to warn Merkel in her comments not to pressure Mitsotaxis in connection with Macedonia and not to try to force him to support the Tsipras government, because in the long run this would cause great harm to the interests of the West in Greece, even if Western countries really want to The present moment quickly drag Macedonians into the EU and NATO. Catimerini is convinced that "at today's political stage, neither Greece nor the Balkans will benefit from the creation of a new political movement in Greece, which can easily become a victim of the influence of other powers." Here, it seems, I mean, first of all, Russia, which - after the collapse of communism and on the basis of a general commitment to Orthodoxy - has previously been sympathized with the exclusively pro-Western conservative electorate of ND. The newspaper has no doubt that under the premiership of Mitsotakis, “the normalization of bilateral relations between Greece and the FYROM will advance,” and Skopje will eventually join NATO. Well, delicacy and flexibility are not entirely German virtues. We'll see if Merkel succeeds at the end of her chancellorship, after a series of painful internal political failures, to accomplish a foreign policy miracle: to make the Greeks to step over themselves.